Jamie Markle has always had an eye for color, for design and for materials, knowing how to put things together in new ways and how to reach out to the viewer and grab their attention. Markle started his painting career during college, due to a cancelled art therapy program and a passion for painting and drawing. His skills as a designer and an eye for public interests led him on a lengthy journey from product development at a clothing company to his present career, and path back to the arts, as a group publisher for F+W Media, the company that produces North Light Books, The Artist's Magazine, The Pastel Journal and Watercolor Artist, along with many other publications and websites for artists. Much of Markle's current work is in mixed media, but he also still does quite a bit of figure drawing and oil painting. In his oil paintings, Markle tends to use flat brushes and filberts for his work, 1" size and under. As he works on an easel, Markle often steps away from his pieces to work on the perspective and overall layout, so he prefers long- handled brushes that allow for measuring and changing his grip. Changing the grip from the end of the brush or close to the ferrule allows for different types of strokes, for laying the paint on the canvas in different movements, creating the flowing work that Markle is known for. Markle says his work is influenced by the modern artist, Robert Daughters and the Impressionist painters, their clear strokes of color defining shapes and shadows. Markle's mixed media work has a similar feel to his oil paintings, rich line work, brilliant color and a sense of familiarity with the subject, influenced somewhat by Egon Schiele. Even though much of his mixed media work is collage, Markle believes that brushes are just as important in this work, especially those that are wide to carry glazing, top coats and gesso. He suggests that every artist carry a good gesso brush as this is the foundation for a painting. Markle also recommends that beginning artists carry a range of flats and rounds while considering the scale of what is being painted, which will alter what sizes one chooses. Filberts, he says, "will also help create definition and sharp edges in oils." Some of the new Paddle brushes that Dynasty has coming out in Michael's would be good considerations for doing mixed media work, glazing, gessoing or top coats, as they are wide flat brushes. I'll share more about these cool new brushes next week. In the meantime, to learn more about Jamie Markle and his work, visit his Facebook Page. Bristle or Hair? A long time competition between the two main types of natural tufts on brushes is a decision best left up to each artist individually. We won't go into the differences at this point, but shall we look at bristle specifically? Bristle tufts are made of the sharp, tough, cylindrical bristles from hogs or boars. As with other natural fiber brushes, the region where the bristles hail from results in their name as well as their quality, sort of like wines from Europe. Shanghai, Hankow and Chunking are a few of these regions in China, with Chunking being the region where these boars run, a cold environment producing bristles that are sturdy and long. Once they are plucked, the bristles are gathered and sent to brush makers for processing. Then they are bleached, boiled, straightened and interlocked to create amazing brushes. Bristle brushes have what are known as flags. Flags are sort of like split ends on the bristles. The length of the flag is important to the quality of the brush. Preserving these flags by not trimming them creates a brush with more agility and fluid capacity, which is how brushes are cared for at Dynasty. The shape of the bristles as they are bound together also effects the quality of the brush. Within Dynasty, the interlocking method creates the highest quality brushes using the natural curve of the bristles. As they dry from boiling, the bristles naturally curve to one side or the other. These curves are matched together to form the shape of the brush tip. In lower quality brushes, the curved imitation shape is made by starching the bristles and shaping by hand, which can lead to fraying and straggly bristles after use, a brush that no longer looks like the one that was purchased. However, the interlocking method creates a brush that stands true over the test of time and use, developing a sharp chiseled edge, keeping its shape for its lifetime. Dynasty has a few series that use chunking bristles; Beau Blanc and Interboro being the most popular for professional artists, both are good with oil and acrylic paints. These brushes stand up well to heavy bodied use and solvent cleansers. The stiff bristle may leave a brush mark on the canvas, if that is your painting style, but it can also define strong edges and sharp details. Dynasty harms no animals in the making of their brushes; these brushes along with any natural hair brushes from Dynasty are created from the by-products of other industries. Ulysses is one of those artists that has always been surrounded by art, growing up with two artist parents and getting into the studio early. He remembers using one of his father's shirts for a smock and exhibiting as a child. So it is no wonder that Ulysses has been showing his work extensively since college and honing his skills in the acrylic medium, his preferred choice for many years. Although Ulysses technique involves a number of tools and methods to create the layers he applies, he uses brushes for the fine details and glazes that can hold up to "abuse and not lose hairs." He has a unique method of carving his paintings to create depth, and painting washes in carved out areas, leaving sharp edges with otherwise soft washes of color. Ulysses leans towards high quality synthetic brushes that can hold their shape well and not fray or warp over time. Recently, Ulysses came upon the Faux Squirrel series from Dynasty and says that the soft synthetic works well for his process and has a wonderful price point for his budget, a good thing for any artist. Ulysses recommends for a beginning artist to start a brush collection with rounds and filberts of primarily larger sizes, and not necessarily use many small brushes as they can "limit gestural accidents that may offer discoveries." It is an interesting and insightful concept that a brush can lead to creating work and opening new technique doors if the painter will let the tool lead the way. I thought it might be helpful to begin a series on paint brush tips (no pun intended)☺ . There are myriads of advice articles on choosing the right brushes, caring for them, identifying the differences and using the right ones for specific mediums. However, here on the Dynasty blog, I'll do my best to bring all of that content together in one place. It would make sense to start with the anatomy of the brush. Brushes are put together with three separate parts: Tuft, ferrule and handle. We'll analyze each separately and discuss the differences between materials that are used in the manufacturing of quality brushes. Instead of beginning with the tuft end, or that which one dips into the medium, I'll start with the handle. You might be wondering why the handle is important to the brush, or why I would spend time discussing this at all. But, have you ever noticed the ferrule becoming loose on the handle? Or the paint peeling off the handle, or discovering that the handle didn't "feel" right in your hand as you were working? Or even noticed that the handle wasn't straight? Handles are made of hardwoods, quite often beech. Wooden handles offer better balance, luxurious feel and are more comfortable for holding long periods of time. Handles are either short or long, though there are not yet standards for exact lengths. Manufacturers differ slightly on their handle lengths. Coatings are also different between manufacturers and types of brush, varying from the inexpensive raw wood, to lightly varnished or tumbled coatings, to the high quality and more attractive, dipped handle. Dipped handles are created by dipping brushes into separate coatings and allowing to dry between layers. These brushes are more resilient and more attractive as a result. Dynasty's Black Gold line, all hand crafted and dipped, has kiln dried wooden handles with seamless metal ferrules, carefully crimped to provide long lasting and water-resistant usage. Kiln drying removes moisture in the wood. Each brush also receives a moisture barrier coating to help resist cracking and peeling. Even with this protection, brushes shouldn't soak for a long time in water, which could loosen the ferrule or bristles. You'll notice this high quality in the Black Gold brushes the first time you pick one up. The handle end of the brush is just as important to art making as the tuft. An artist comes to depend on how the handle feels in her hand, the length of the handle and the sturdiness of its attachment as she paints. Dynasty has both short and long handled brushes as well as the patented hour-glass shaped, Symmetry series. The Symmetry series is shaped specifically to reduce painting fatigue while extending painting time, a consideration if you are looking for a new type of brush to try. Keep in mind the handle end of the brush, not just the tuft when you are looking to buy new paint brushes. You won't regret purchasing quality. Janet Taylor is a high school art teacher with a long history of working as a fine artist and scenic artist in New York and Chicago. She works in a range of mediums, but her paintings focus on unusual portraits and abstractions in oils. Janet began oil painting in an after school art program in the 4th grade, and even though it was frustrating at the time, oils became her love and she pursused a degree in art in college. Janet says that "a quality brush makes all the difference in [her] art". A cheaper, wiry brush just doesn't do the work justice, but with the right tool, Janet's work can have both smooth, soft translucent layers as well as thick, heavy heaps of oil without having scratchy texture through the strokes. At least, this is how Janet works now, but she says that at the time, working as a scenic artist in film and theatre, sometimes a work would call for a brush that was frayed and could scratch up a surface to age it or create texture. For her fine art, though, she requires a brush that is sensitive to her medium of choice, and one that has staying power. Since Janet has worked in so many mediums, she has purchased numerous brushes for all sorts of uses, collecting the brushes that work best for whatever medium she is focusing on at the time, or whatever school project she is developing for her students. However, in oils, she work with stiff, long handled bristle brushes for the abstract pieces and rather soft hair brushes for her portraits. 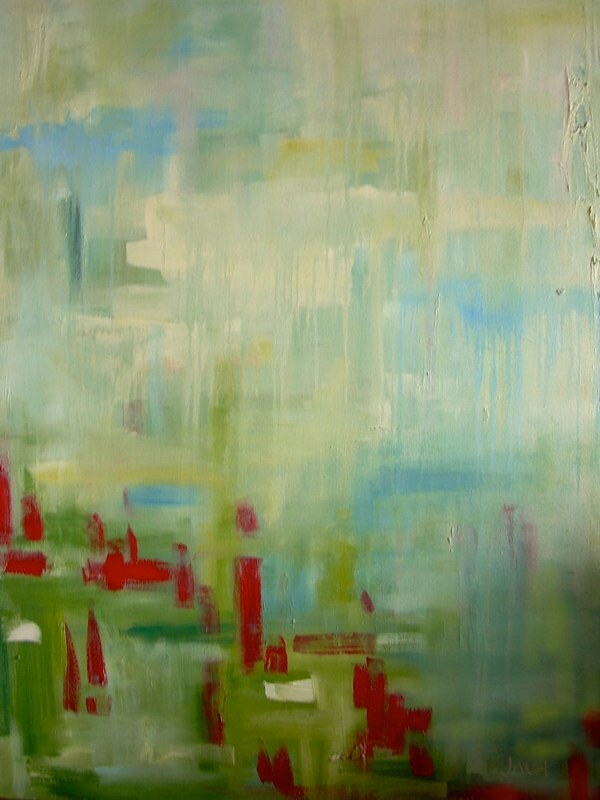 For more of her abstract work, Janet sticks to short bristled, long-handled brushes from 1" to 3". Janet compares brush buying to finding the right pair of jeans. "Sometimes you have to try on 30 pairs before finding that comfy Saturday jean that fits like it was meant for you." For new artists or brush buyers, she suggests trying a lot of brushes, in different styles but lower price ranges, knowing that most brushes will have a specific role or work for one medium better than another. She says, "I have such a variety of brushes from softness, to synthetic, to natural, to long bristle, short bristle, rounded, square. . . each one has a role in my artwork suited for the specific technique or medium I'm working with or effect I'm trying to achieve." To find out more about Janet, check out her website. Faux Kolinsky Red Sable on seamless nickel ferrules with long black albata dipped handles. 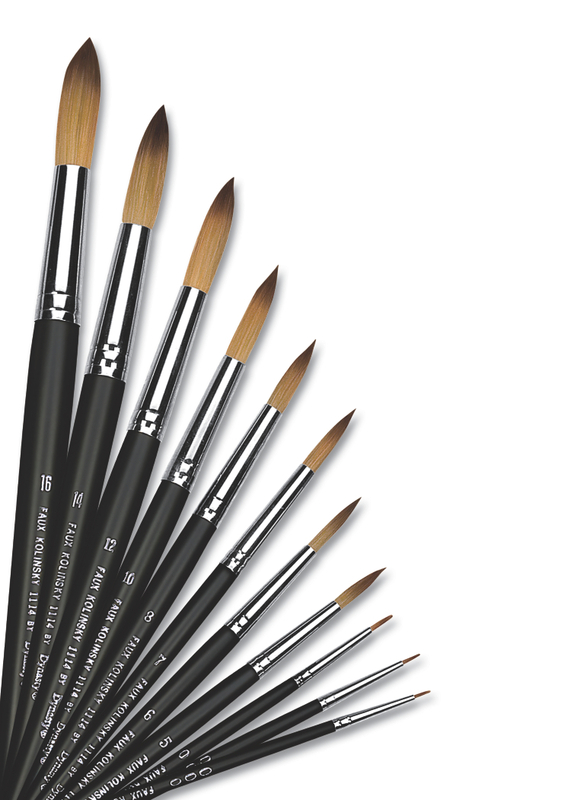 One of the most popular and well known natural brushes for artists is the Kolinsky sable. It is made from the tail hairs of a weasel found in Siberia, where the tails grow thick and long, producing lush tapered hairs that hold a lot of fluid when wet. Because of the brushes' popularity, and because Dynasty is always looking for ways to create better brushes that are easier on the environment, last year Dynasty revealed its Faux Kolinsky Brush. With a year in development to find the perfect blend of synthetics, FM Brush, the parent company of Dynasty, released this faux Kolinsky series. It is a brush that recreates the attributes of the Siberian Sable brushes, and yet is a socially responsible alternative to animal hair. This brush has been fine tuned to replicate the performance of the Kolinsky, with special attention paid to the tip in order to mimic the generous reservoir of the natural brush. It is available in the round sizes from 3/0 to 16, and can be purchased from the distributors who carry Dynasty Brushes. If you need to find one of those distributors in your area, use the Search page on the Dynasty website. Scott Gellatly was one of those child artists that just never stopped drawing and painting as he moved through life. His work is anything but childlike, showing great care and softness of the details in his oil landscapes. Scott now works with Gamblin Artist Colors as the product manager, so he knows a thing or two about high quality art materials. He chooses professional grade oil paints as well as finely finished wood panels for his substrates and uses high quality brushes to apply his strokes. "Last of the coastal light"
He believes that the brush is an extension of his hand, so his tools are incredibly important to his work, having the right shape, the right amount of flexibility. Traditionally, he works with filbert bristle brushes, "I don't care for the sharp edges of brush-marks that flats give, though I find small flats useful for smaller marks," he says. The filberts allow for Scott to move the paint around without leaving strong brush marks. Scott has been painting for so long that it is an intuitive process for him, as with many artists. He shares that "any brush techniques he applies are simply part of the intuitive painting process, the length and softness of the bristle, how the brush is held, the amount of pressure put behind the brush and the viscosity of the paint are all important" in achieving the variety of mark making in his work. For a new artist, Scott recommends choosing different styles and shapes so that experimentation can help in finding the right tools. Dynasty has a lot of brushes to choose from for new artists, so tap into the brush wizard to get started looking for brushes that might work for your medium and style. "Take time to experiment," Scott suggests, "and soon the right tools will become evident." For more information about Scott's work, refer to the Brian Marki gallery. Chris Haughey shares the unique features of the Butterfly brush; a soft dual part brush that offers textures and strokes unlike any other fine art brush. Dynasty has created this uniquely for decorative painting, whether on furniture or fabric. However, the Butterfly brush could also be used in fine art for landscape textures or soft watercolor strokes. For more details on the Butterfly brush or for other videos demonstrating the Butterfly, refer to the website. To find out more about Chris and her work, check out our Featured Artists' section on our website. 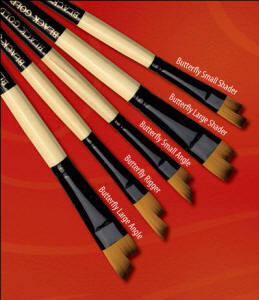 Black Gold has a series of specialty brushes, like the Butterfly Brush featured in this video above. To see more specialty brushes and learn about their uses, keep following the blog. ;) And, check out this previous post on the Black Gold Specialty Series.